Windows Live Messenger 9.0 Beta: yes, the features! Two of these features were taken from the well-known wishlist. The multiple points of presence feature is particularly interesting for those who use Messenger on their home and office PCs as well as mobile device(s). And spam reporting will hopefully replace the current inefficient URL filter. More on these features and extra ones as soon as we find out! >> Give your opinion on these new features in our forum topic. "The Messenger Buddy is trapped inside a computer and he needs your help to escape!" That's the idea behind a new publicity campaign, promoting the "out of office" use of the convenient Windows Live Messenger client on Windows Mobile 6 devices. The website itself is a clever mashup between an Espace the room game and the many subservient something sites that have surfaced over the past few years. On the Free Your Buddy website, you'll see the Messenger buddy sitting in his comfy chair, waiting for your instructions (eg. kiss, eat,...) which you have to enter in a little conversation window. The goal is to get him out of the dull and shabby environment. As with all these type of games, there are a few easter eggs, or secret commands that make the buddy do silly things. Select the white space below to reveal the eight different moves I have found so far. There are many synonyms that trigger the same actions, but let me know if you find one that results in a completely new action. UPDATE (21 Nov '07): TheSteve and warmth both submitted a new command: horse. I'm quite sure we now have all of them listed. The game is also likely to be translated into French, Spanish, German and Italian in the future. >> Have fun at freeyourbuddy.com. Web-based IM aggregator, Meebo, has today moved one step closer to its big brothers, the proprietary software clients, by adding over 20 games that can be played against any online buddy. Provided by various game developers, the games range from Backgammon to Battle Pool and from Sudoku to Sploder ("a futuristic shooter"). Meebo users, and Meebo users only, can access the list of games through the rocket button ("Applications") in the conversation window and launch them within. Invitees on other clients will have to click a link first in order to be redirected to the game session's web page, just like with Meebo's file transfers. eWEEK is reporting about a new trojan which is using the Windows Live/MSN Messenger platform to grow a botnet "by hundreds of infected PCs per hour, adding VMs to the mix as well.". As usual, the malware is being distributed through file transfers that are seemingly digital photos, like for example DSC00432.jpg.exe (note the double extension) or a .zip file with the name "images" as a .pif executable (eg. IMG34814.pif). "The eSafe CSRT (Content Security Response Team) at Aladdin—a security company—detected the new threat propagating around noon EST on Nov. 18. At 18:00 UTC (Coordinated Universal Time), eSafe had detected 1 operator and more than 500 on-command bots in the network. Less than three hours later, or by 2:30 EST, when eWEEK spoke with Roei Lichtman, eSafe director of product management, the number had soared to several thousand PCs and was growing by several hundred systems per hour." More info over at eWEEK, and be extra cautious with incoming file transfers. UPDATE: As of late today, the botnet had already been built out to over 12,000 machines. We caught a first glimpse of Windows Live Web Messenger back in September, and the people behind the successor to MSN Web Messenger have decided to disclose more information to the public by updating the screenshot on the product's notorious dogfood website. Messenger Stuff's andyman has inspected the new screenshot carefully and labelled all its bits, the result of which can be seen here. - Windows Live 2.0/Windows Live Messenger 8.5 interface. - "Last message received" time stamp. - Word wheel for contacts/address book. - Connect with Yahoo! Messenger contacts. Take notice that the Wink, Font/Color and Background buttons visible in the earlier screenshot have disappeared, and that the screenshot doesn't reveal yet whether it's possible to send and/or receive custom emoticons. We're hoping to see an official Windows Live Space from the WLWM-team and, who knows, a public Beta-version soon! Paying your bills is never any fun. It takes a reasonable amount of work, and most important, a lot of time (which can of course be better spent IM-ing your friends). 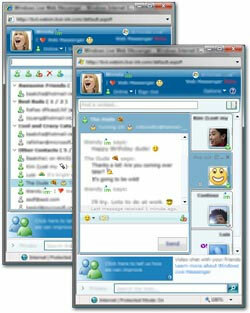 However, for over 6 million Dutch messers there will soon be a solution: pay your bills using Windows Live Messenger! On 15 November Microsoft and the Dutch postal service TNT Post announced a cooperation which will allow business customers of TNT Post to send digital bills to customers via Windows Live Messenger. While the digital bills have been available to customers of some Dutch banks since 2001 (using online banking), the ability to pay your bills via an IM-client is unique in the world. The details at this point are still a bit sketchy. It is unclear how the bills will be delivered to you on Messenger for example, although it will probably involve either receiving alerts, or adding a Windows Live Agent ("BOT") to your contact list. The service will be made available early next year.